The Yi Jing ‘Book of Changes’ was foremost among the five ancient classics of China. Kongfuzi (Confucius) is reputed to have said “If years were added to my life, I would dedicate fifty to study the ‘Yi Jing’, then I might approach perfection” (Analects 7.16) . “The Yi Jing thinks of nothing, does nothing; in tranquility, unmoving, it fathoms what is at the back of everything in the world” (Great Appendix to the Yi Jing). Many great scholars have studied the ‘Yi Jing’, which is still widely known as ‘I Ching’ following the Wade Giles system, as a source of contemplation and reflection. Marcel Granet ➚ has described it as “the Cosmos in capsule form”. It served as a broad method for characterizing all things, people, events and situations systematically. As many objects and actions are associated with a particular hexagram it was used as a proto-science - putting everything in its appropriate logical context. Joseph Needham ➚ used the term ‘Resonance’ to describe each hexagram's relationship to the world. 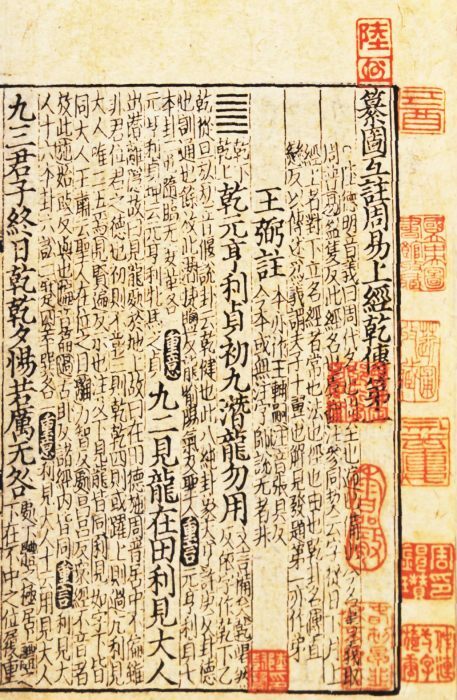 In Imperial China its influence was all pervasive; the Qing dynasty Emperor Kangxi’s edition of the I Ching had by 1715 accumulated no less than 218 commentaries written by esteemed scholars. The Emperor ‘never tired’ of studying it, spending over six months studying it - twice - and consulted the book to determine such things as the just punishment of rebels. He considered it of great depth touching on both fortune-telling and morality. It is called ‘Book of Changes’ because it is rooted in transformation. In the classic divination method two hexagrams are cast at the same time, the one changing to the other. Feng Shui, Confucianism and Yin/Yang all contribute to the ‘(Book of Changes ➚’). Nowadays it is best known as a popular fortune telling system, but its foundations go far deeper. It builds ‘hexagrams’ made up of six lines that are each either yang (solid) or yin (broken). A hexagram is termed a gua 卦 guà in Chinese. 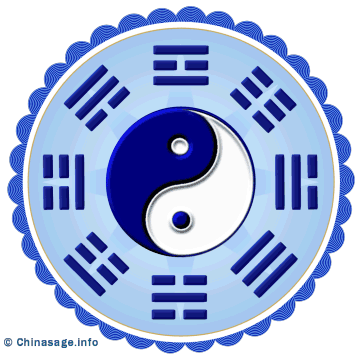 It is a combination of two trigrams made up of three lines to form one of eight trigrams (bagua 八卦); that are shown surrounding the traditional taiji (yin-yang) figure in the illustration. Two trigrams combine together to give the six lines that represent one of 64 possible hexagrams. For more on the numerical properties and associations see our Luo Shu (magic square) section. To consult the I Ching, a person makes six choices between yin/yang; short/long; broken/straight; or heads/tails arranged in two sets of three. Each line is called a 爻 yáo and is represented by the number 9 for yang 阳爻 yángyáo or 6 for yin 阴爻 yīnyáo. The meaning and interpretation are strongly influenced by the two trigrams that make up the gua, for example the trigrams for ‘water’ (坎 kǎn) and ‘fire’ (离 lí) combine to give hexagram 63 (jì jì 既济) which has the meaning of ‘transformation’ as water puts out fire and also fire dries out dampness. Some idea of the power of the Yi Jing can be seen from the belief that the invention of wooden boats first came from the book. The hexagram 59 is associated with the wood element and is composed of ‘wind’ over ‘water’. The commentary states that it is advantageous for crossing a great stream and so it is interpreting as stating that wood is the suitable material to use for making boats. The Yi Jing dates back about 3,000 years when it was probably used purely for divination. Although it is claimed to date from the start of the Zhou dynasty there is no direct evidence to support this. The oldest text is called 周易 Zhōuyì after the name of the dynasty and attributed to legendary Emperor Fuxi (c. 2800 BCE) and King Wen of Zhou ➚ 周文王. It was certainly used in China during the Zhou dynasty long before the birth of Confucius (551BCE). To the ancient text were added ten commentaries attributed to Confucius that are called the ‘ten wings’; but these were probably written long after Confucius during the Han dynasty. Yì 易 can be translated as 'easy' as well as 'changes' and it could be considered that this method of divination was quicker and easier than analyzing the original divination method of studying the pattern of cracks on oracle bones. It is the Yi Jing commentaries that have as great a value as the hexagrams themselves, they reveal much about Chinese thought, history and philosophy. Daoists just as much as followers of Confucius hold the book in great esteem. All this has made it a much more sophisticated system than other mere ‘fortune telling’ systems such as Tarot cards ➚. The original method used in ancient times cast a hexagram by using a bundle of 50 yarrow sticks 蓍草 shīcǎo (split six times to give each line - see divination method section for a detailed guide). In the Tang dynasty a faster method using three coins was introduced. However the probabilities are not the same in the two methods. The more complex system uses four choices rather than two, instead of just yin and yang this method produces both ‘continuous’ and ‘changing’ versions of yin and yang. Two readings are produced, one for the present and one for the ‘change’ representing either the past or future. The two readings in combination give 64x64 (4096) possibilities which make it a very large and complex system. Each trigram (八卦 Bàguà has its own name and meaning. They are traditional thought of as pairs heaven & earth; mountain & lake; water & fire; thunder & wind. See our yin-yang section for more on derivation and background. Two trigrams together give a hexagram or gua for the Yi Jing. There are actually three Yi Jings, the best known is the most recent the 周易 zhōu yì or ‘Change of Heaven’ from the Zhou dynasty which begins with the 乾 Heaven gua . The 连山 Liánshān ‘Link to Mountain’ on the other hand begins with 艮 Mountain and is attributed to the Red Emperor or Shennong a thousand years earlier. The 归藏 Guīcáng ‘Save in Earth’ starts with 坤 ‘Earth’ and is attributed to the Yellow Emperor. However only the Zhouyi has survived intact and has the all important commentaries. The Zhouyi ordering is also known as the ‘King Wen system of hexagrams’; it does not follow a mathematical progression. One might expect the binary nature of yin-yang to be reflected in a binary sequence so mathematically 111111 (乾 qián all yang) might be followed by 111110 (姤 gòu) gua 44 or by 011111 ( 夬 guài) gua 43. The 'Ahead of Heaven' ordering of the Song dynasty follows this strict binary order; but the King Wen arrangement is in pairs of inverses or opposites so qián is followed by 000000 (坤 kūn all yin). As qián is symmetric (it is its own inverse) its opposite gua ‘kun’ is chosen as its pair. As a ‘Book of Changes’ it is appropriate that guas are ordered in transformed pairs. The next pair begins with 010001 (屯 zhūn) and its inverse is 100010 (蒙 mēng) in this case the pair reverses the order. The arrangement of hexagrams has puzzled scholars for centuries as there are strong patterns of related concepts within the ordering. As the original text was written so long ago the original symbolism and meaning has been lost and reconstruction is a matter of scholarly conjecture. The most ideal structure for a hexagram is for yin lines to occur at 2 and 4 but yang lines at 3 and 5 (counting lines from the bottom) give most benefit. The alternating nature of the ‘ideal’ figure highlights the Chinese desire for balance and counter-balance rather than a desire for pure yin or pure yang. The sequence is split into two unequal groups: the Upper Canon 上经 shàngjīng 1-30 (where yang is broadly dominate; the ‘Dao of Heaven’) and the Lower Canon 下经 xiàjīng 31-64 (where yin is broadly dominate; the ‘Dao of Humanity’). No. The hexagram number in the King Wen ordering of the Hexagrams. Gua The Chinese character, pinyin and old seal script form of the hexagram (gua). Name Two attempts at translating the gua into English. This is tricky as different translators use different words. Here we provide a link to a web page that provides a full description of each gua. Composition The names of the two trigrams that make up the hexagram, these often give a strong hint on interpretation. Element The Chinese element associated with the gua. Month Chinese lunar month number associated with the gua, or else event in solar year. Opp. The number of the Opposite gua, that is the one where each yao is changed yin to yang or yang to yin. Inv. The number of the Inverse gua, where the hexagram is turned on its head. Mut. A re-arrangement of the lines and selective inversion give a related or Mutual gua. Associations Some of the known associations of the hexagram. Because the hexagrams in the King Wen ordering are not placed in numerical order it can take time to look-up a hexagram. This table lists all the hexagrams ordered by the two trigrams that make them up. The top trigram is along the top and the bottom trigram is on the left side. Simply follow the row and column to where they intersect and follow the link for more information. The authentic methods for casting a hexagram give four not two outcomes for each line of the hexagram. These are yin, yang, changing yin and changing yang. If any of the lines are 'changing' this gives two hexagrams, the first using the initial choice and the second where all ‘changing yin’ lines are changed to yang and all ‘changing yang’ lines are changed to yin. The commentaries of the Yi Jing only give a commentary when there is a single changing line. In the less likely case that more than one line is changing great skill is required to interpret the meaning of the change, quite often the hexagram is cast again. 10 : Summarizes the meanings of the guas in a simple rhyme but does not follow the King Wen sequence. The text and commentaries are hard to follow because they allude to unknown events and customs in the distant past. Some of them are put into poetic form with rhymes. This allows a modern reader to interpret the meaning in different ways. The all embracing nature of the Yi Jing can be seen from the associations of hexagrams. The lunar cycle follows through the hexagrams 51; 58; 1 (new moon); 57; 52 to 2 (full moon). While the daily cycle passes through 24, 19, 11, 34, 43, 1 (noon), 44, 33, 12, 20, 23, 2 (midnight). In ancient China the Yi Jing was all pervasive, deciding what should be done and when; even the ministries of the government were associated with particular gua: General administration (1); Ministry of Education (2); Ministry of Rites (51); Executive (52; 57 and 30); Ministry of Justice (58) and Ministry of Public Works (29). The Yi Jing was consulted on all decisions in the Imperial system. In this way a single gua has a great number of important associations and forms a complex network with many other related concepts. The Yi Jing provided the master plan for organizing everything. Citation information for this page : Chinasage, 'Yi Jing (I Ching) Book of Changes', last updated 5 Dec 2016, Web, http://www.chinasage.info/YiJing.htm.